Exclusively ours. Alexandre Vauthier metallic cocktail dress. Plunging neckline. Exaggerated shoulders. Long sleeves. Bow waist. Body-con fit. Hidden back zip. Mini length. Silk/polyester. Lining, viscose/Elite polyester. Made in France. Alexandre Vauthier structured velvet cocktail dress. Plunging neckline. Strong shoulders. Long sleeves. Body-con fit. Hidden back zip. Mini length. Cotton; lining, viscose/Elite polyester. Imported. Exclusively ours. Alexandre Vauthier velvet cocktail dress with 5 crystalized buckles. Strapless sweetheart neckline. Ruched silhouette. Body-con fit. Mini length. Cotton; lining, viscose/Elite polyester. Made in France. 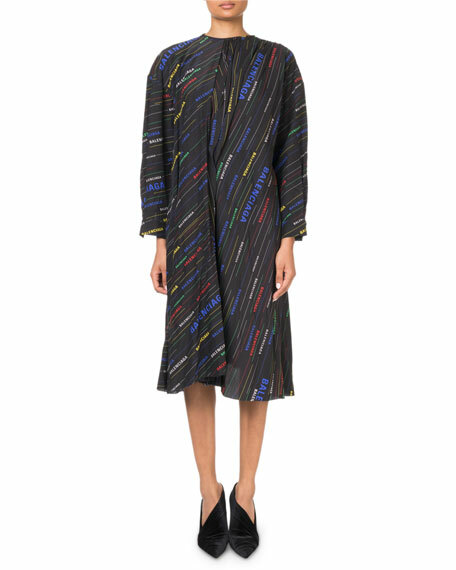 Balenciaga dress in multicolored logo-stripe twill. Crew neckline; tie back. Long sleeves. 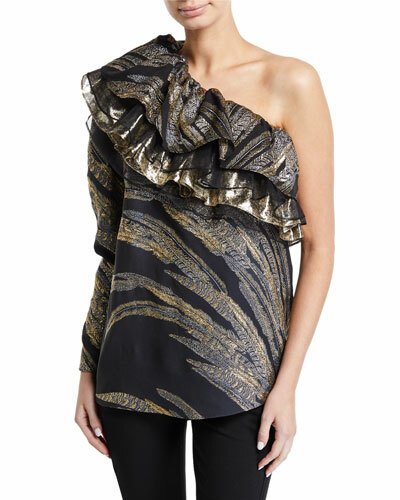 Pleated front detail. Bias-cut; A-line silhouette. Asymmetric hem. Midi length. Silk. Made in Italy.